Kobo has stepped up its assault on Amazon's dominance of the e-reading market with its newest release that boasts a "high definition" e-ink display. 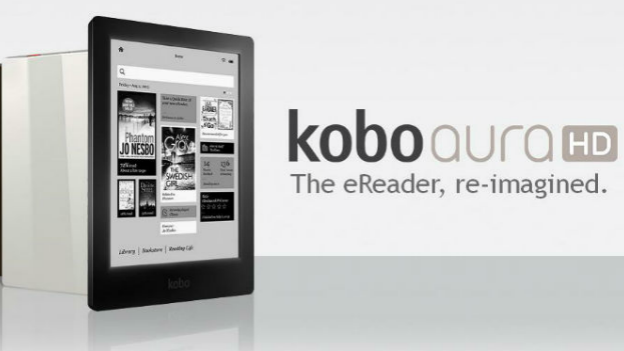 The Kobo Aura HD was unveiled yesterday and is being shown off at the London Book Fair this week - with the Canadian company hoping to close the gap on the market-leading Kindle line-up. The Aura HD is a 6.8-inch e-reader with a 265ppi display. It's ahead of the Kindle Paperwhite, which only manages 212ppi on its 6-inch screen. The rest of the specs include a 1Ghz processor and 4GB of native storage that can be upgraded to 32GB. Useful if you happen to own your own library. There's no 3G capability at present, so you'll have to rely on Wi-Fi to browse the Kobo online store and buy more books. Kobo says that the Aura HD will give you a battery life of over a month - good thing too, if you've got 32GB of reading on there. Kobo itself might not be as well known as Amazon, but the company has done well in the UK through a tie-in with WHSmiths. That'll be your best bet for hunting down the Aura HD when it arrives here on April 25. The Aura HD will come in at £139.99 which could be a little hefty when you consider the Paperwhite is £109 and the standard non-HD Kindle e-reader is even cheaper at £69.